To get a Free Trial of Our eLearning Solutions, Ask Questions, or Request a Custom Proposal. Trends in biopharma are rapidly evolving with new challenges and regulations. Do you have a plan to advance your functional teams? 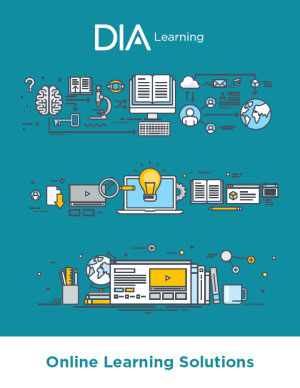 To keep you at the forefront, DIA delivers blended learning curriculums that meet the diverse needs of professionals across the medical product development spectrum. DIA learners develop a set of practical skills that meet or exceed accepted standards to apply to their current and future careers. We deliver solutions to address learning needs in safety and pharmacovigilance, regulatory affairs, clinical research, medical affairs, project management, and more! Online. Whether it is an eLearning program for groups (allowing learners to go at their own pace and have access for one full year), or an online training for your team, we bring learning to you, anywhere in the world. Face-to-Face. Bring DIA to your office or local community. Get live, in-person training and save on cost without compromising value or outcomes.